In 2018, the school saw a need to create new outdoor learning spaces for their students. 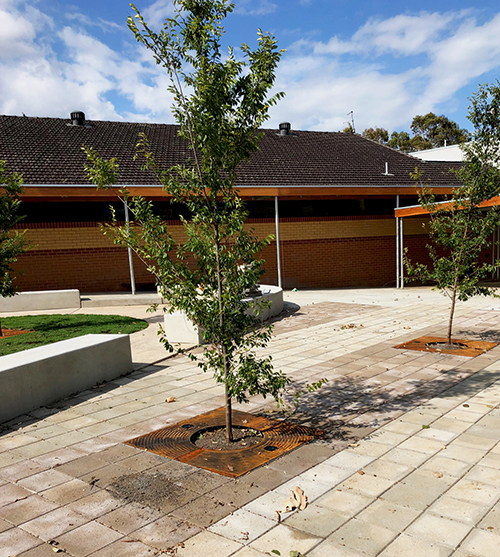 The Catholic Schools Office (CSO), Maitland Newcastle, commissioned the construction of a new learning centre, together with a modification of the existing library into a flexible resource centre. As part of the upgrade, Citygreen was engaged to enhance the areas with urban trees and much needed shade. 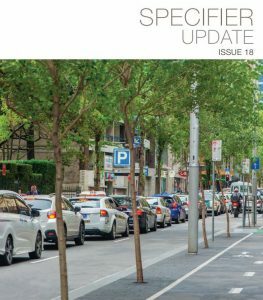 In this case study, we explore how Citygreen worked with landscape architects, contractors and stakeholders to transform these spaces using Stratavault technology. 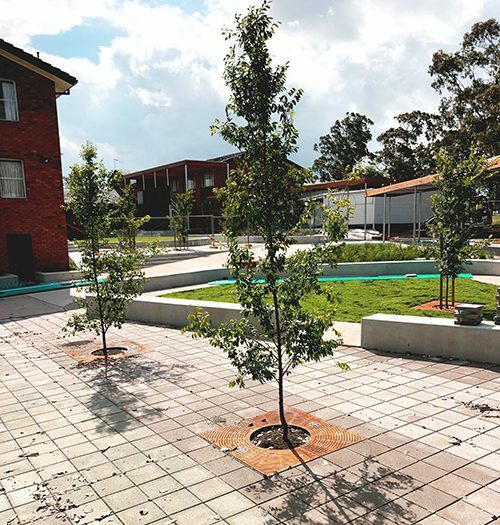 The goals for this project were two-pronged – to create lively external learning areas to complement St Clare’s indoor facilities, and to green the new outdoor spaces with healthy trees and shaded seating for students to enjoy. The vision was largely executed by Terras Landscape Architects, who were engaged by Austin McFarlane Architects to manage the landscape design elements. The scope of Terras’ work included design and documentation of the main courtyard, plus documentation of the external learning area, amphitheatre and street landscaping. 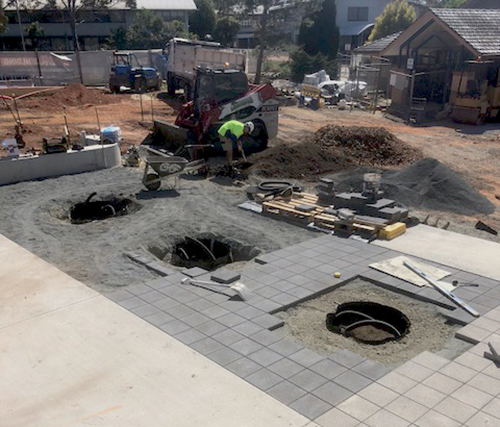 Terras were supported by Great Gardens Landscaping Contractors, who performed the installation, paving and landscaping using Citygreen’s Stratavault technology. 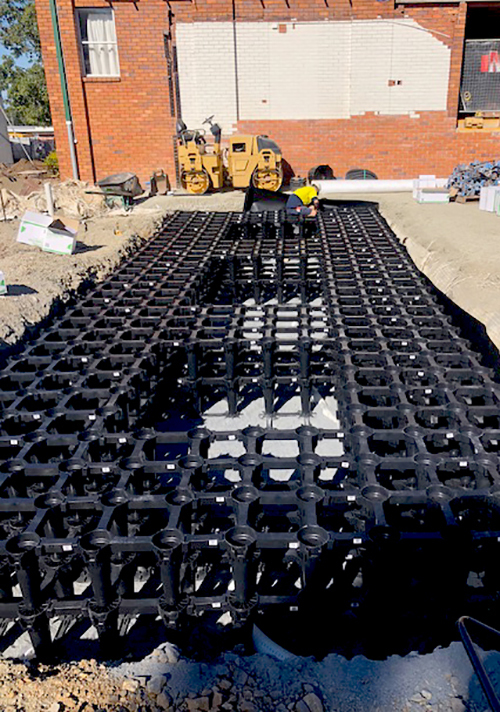 Stratavault soil modules were applied in three configurations, each comprised of up to four layers. A 750mm tree pit and grille were used in areas where space permitted. 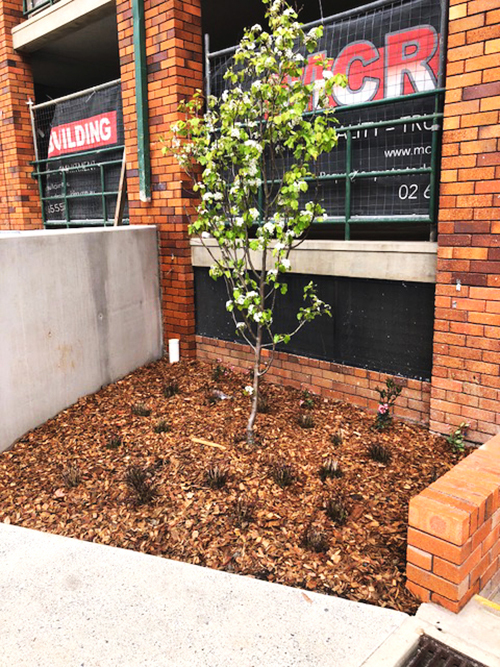 For smaller areas, a linear tree pit and grille provided a more compact solution. Stratavault was chosen for its open structure and huge growth zone, which provides plenty of soil volume and space for delicate root systems to flourish. With more than 94% of soil volume allocated for tree root growth, Stratavault creates optimum conditions for long-term healthy growth. Given the heavily paved environment at St Clare’s, this was a key priority. Completing ground level works on top of the Stratavault System, in preparation for the new trees. Chinese Elm (Ulmus Parvifolia) trees have established well in the Stratavault system and are already developing healthy canopies. “An inspiring variety of outdoor spaces have been created interspersed with circulation, seating and shade, which will develop over the years to come”, said Kate from Terras Landscape Architects.